Armored trucks and vans, and their uniformed crews, are a common sight not just outside of banks but also around ATMs and retail stores. For a supposedly “cashless” society, we have certainly come to take for granted ready access to cash 24 hours a day, 7 days a week. This kind of easy access to money wouldn’t be possible without strong security measures to safely store and transport large amounts of currency and coins, because the risk of theft would be too great. 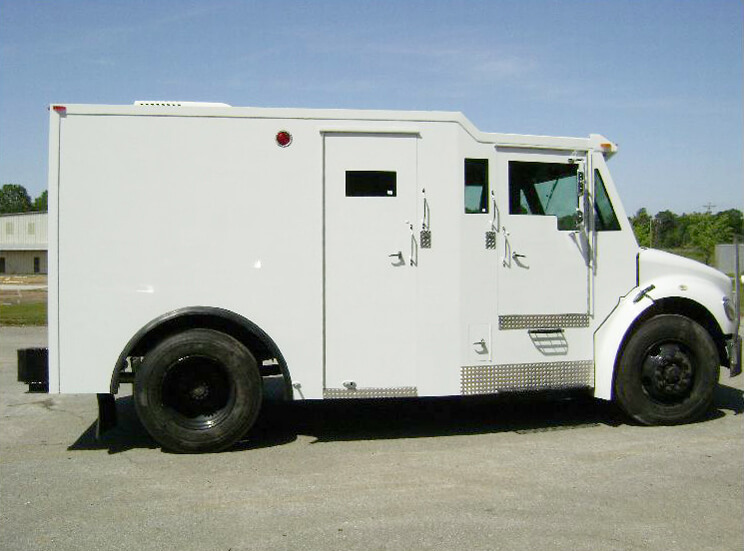 Armored vehicles are the key component of what is now known as the “cash-in-transit,” or CIT, industry. In fact, transporting cash and valuables was the first use for civilian armored vehicles, and when The Armored Group was founded in 1992, we specialized in manufacturing cash-in-transit vehicles exclusively. Today, cash-in-transit vans and trucks, operated by some 55 to 65 carriers in the U.S., deliver billions of dollars from secure warehouses to destinations all over cities and towns nationwide. These carriers usually do much more than just transport cash; today, they offer total cash management services for their clients, as well as offering storage for other valuables such as precious metals and vital records. Some cash-in-transit companies even offer complete ATM services that include not just servicing client’s ATMs, but procuring and installing them as well. However, basic armored vehicle transportation services still produce the majority of the revenue for these companies. Cash-in-transit vehicles are heavily armored to protect their crews and cargo from attempts at theft or hijacking. Their walls and windows are bullet resistant, and as with military vehicles, some have floors that are reinforced to resist explosives. (Armored vehicles’ vulnerability to attacks from explosives placed in the roadway and detonated underneath the vehicle were identified and remedied in the earliest days of the cash-in-transit business, after frustrated thieves successfully turned to explosives to rob an armored van that was transporting cash.) Cash-in-transit vehicles ride on chassis that are reinforced to carry the weight of the additional armoring, as well as large loads of currency and coin. The Armored Group LLC began serving the cash-in-transit industry 20 years ago. Since then, we’ve expanded our manufacturing, sales and service operations worldwide and we now make a wide range of state-of-the-art armored vehicles for police, military and civilian use. We also carry an inventory of high-quality used armored vehicles. At The Armored Group, we pride ourselves on deliver both excellent products and excellent, responsive customer service. To learn more about how The Armored Group can supply your security needs, call us today at 1-602-840-2271.